The full view of parcels and property taxes within Downtown Area are for Cityscape Pro and Cityscape Permits members only. 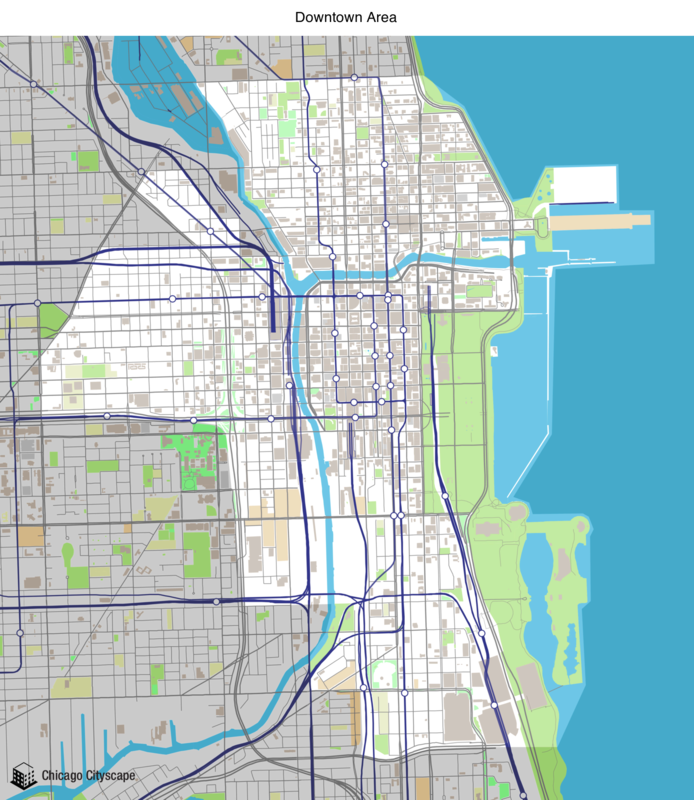 You're free to use our static map of Downtown Area, but please attribute Chicago Cityscape and link to this page. The downtown area is defined in 17-1-1500-A of the Municipal Code of Chicago. It was expanded once in June 2016, once in July 2017, and once in November 2017. The area of Downtown Area is 8.05 square miles. The search area of Downtown Area is 8.05 square miles. Want to know what you're allowed to build in the Downtown Area? Order a Zoning Report instantly from MAP Strategies. Submarket 6 is the most affluent submarket in the region. Despite high home prices and rents, housing cost burden is low due to high incomes. This submarket shares the trait of high transportation costs with other suburban submarkets. The housing stock can be characterized as mostly single-family homes with a mix of both older and newer housing. This largely owner-occupied submarket includes low levels of subsidized housing. Low foreclosure and vacancy levels and a high mortgage activity level have generated a strong housing market. The submarket is composed of mostly highly educated households, with a high share of 2 to 4 person households, moderate levels of children, and the highest increase in people age 60 and over. Show a map of all the Places that overlap Downtown Area, including ZIP codes, Census tracts, legislative districts, and TIF districts (this may take awhile if Downtown Area has a large area).